My idea of the perfect lazy Sunday is browsing through shops – and my stroll through Whiteleys this weekend led me to my favourite part of the shop: the furniture hub! It reminded me that with home refurbishment, knowing where to start can be tricky. To simplify the process, I am going to show you how to begin with sourcing one key piece that fits your home refurbishment costs and go from there. 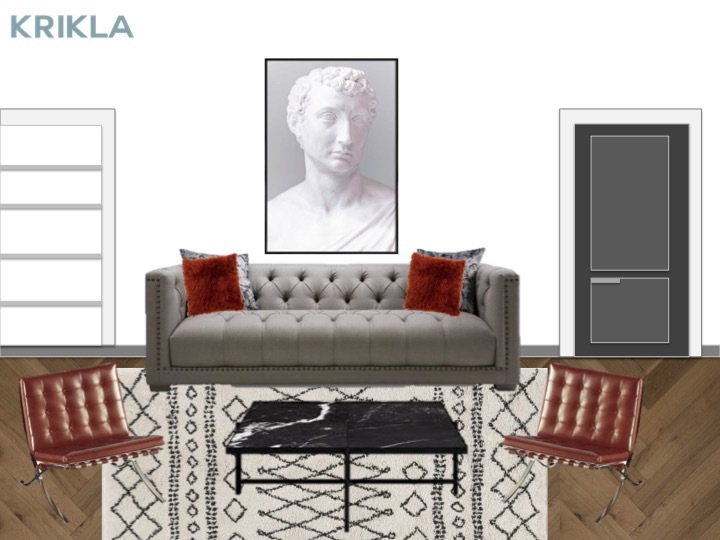 When you hire a Krikla interior designer, you’ll notice there are various techniques and processes we follow to arrive at the sublime final result. Sourcing key pieces is an important component of the interior design packages we offer. It’s more time consuming than you could imagine. It requires a lot of patience and a great knowledge of the collections available at each interior design shop. Often at times, it’s not a matter of simply finding a similar piece to the one you so love on your Pinterest board but finding one that meets all of your design criteria and fits into your home refurbishment budget. With all that in mind, today I’m going to look at how we can base wildly different interior design concepts around one key piece of furniture and also why this technique might be a good place to start for you. As we cater specifically for busy professional families in London, we understand the importance of saving our clients’ time and stress. So if you would like to redesign or refurbish your home, we can help make the most of an interior designer without paying for any unnecessary frills or costs! 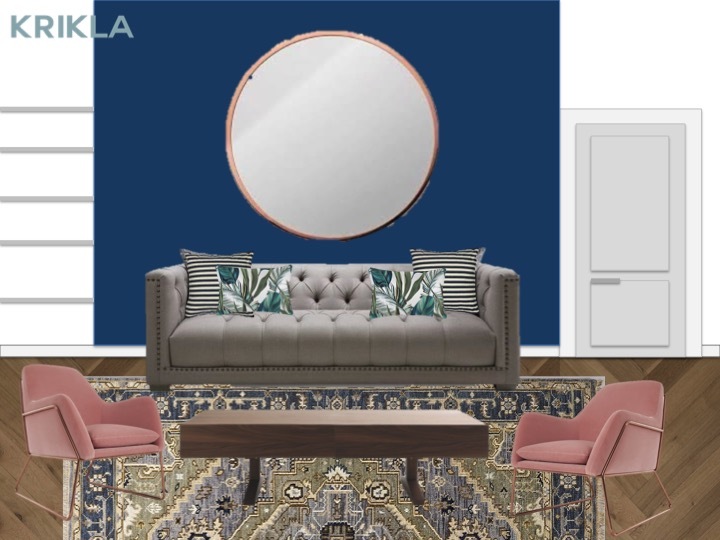 Keeping on top of the latest styles and trends, I have looked at the following key shops in London: DFS, Habitat, French Connection and Lombok. I have chosen to focus on evergreen shapes, neutral colours and the adaptability to various spaces. My pick of the day is a grey, Chesterfield style sofa from DFS. Traditional in style but very iconic in shape, its neutrality is perfect for constructing various room designs. 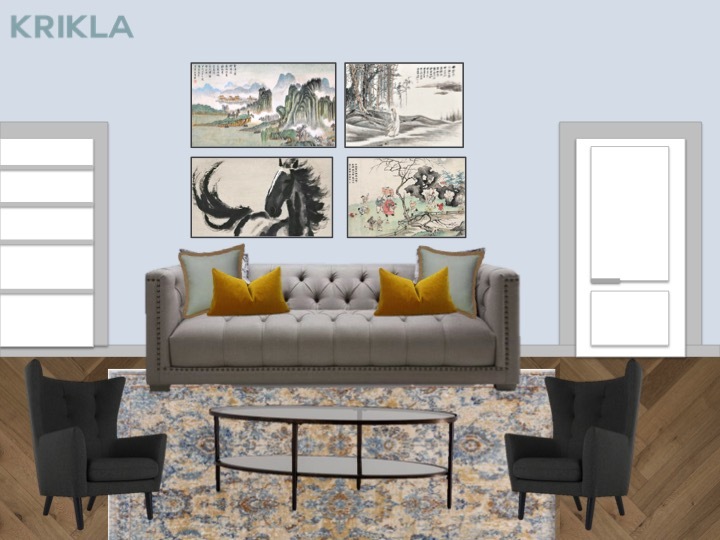 To show you how to simplify the process I have developed three affordable interior designs with the grey sofa as the focal piece of the concept. My design concept slides will represent Traditional, Contemporary and Eclectic styles. Let’s see what we what home refurbishment ideas we can design following this exercise! As you can see, following a creative process like this you can develop three completely different designs based on one focal piece. If this doesn’t work for you, have a look at how to use everyday inspiration for your home refurbishment, or even your holiday photographs. At Krikla, our job is to stay on top of current trends and source the best furniture for your dream interior design. We take the stress out of the process and construct design packages based on your ideas to help reduce home refurbishment costs and create your dream interior space. Whether you are inspired by your everyday surroundings, your own shopping or fun designs on Pinterest, collaborating with an affordable interior designer we can take it to the final interior finish. Would you like to learn more about our interior design process to see how you might adapt it for your own home refurbishment? Contact us to find out more and get your dream interior underway today!